Familiar common names that you might have heard are Buckwheat, Sorrel, Rhubarb and Dock. 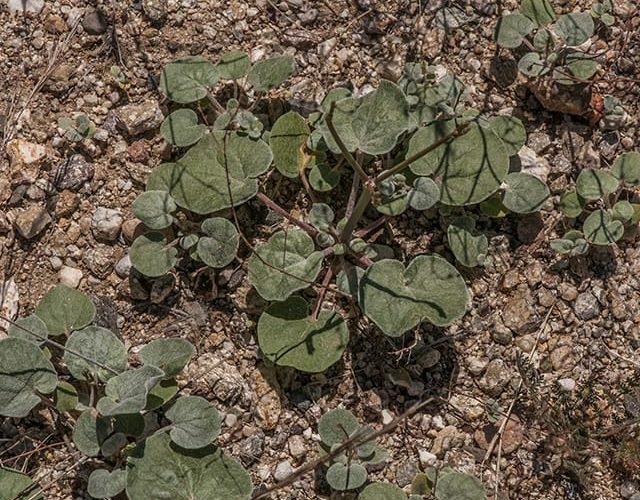 The Buckwheat, or Polygonaceae Family is well represented in the Sonoran Desert by about 100 species. Some of the familiar common names that you might have heard are Buckwheat, Sorrel, Rhubarb and Dock. Some of the plants are edible but the leaves contain high amounts of oxalic acid. Plant in the Eriogonum genus of this family are easily recognizable by their general appearance. One to several stems arise from the base and branch profusely. Most of these plants are about 2 feet tall. Most of the plants have a skeleton like form and bear tiny white to pink flowers at each node. The flowers usually dry to a rusty brown color when spent. We have two that are visible in Sabino Canyon right now. 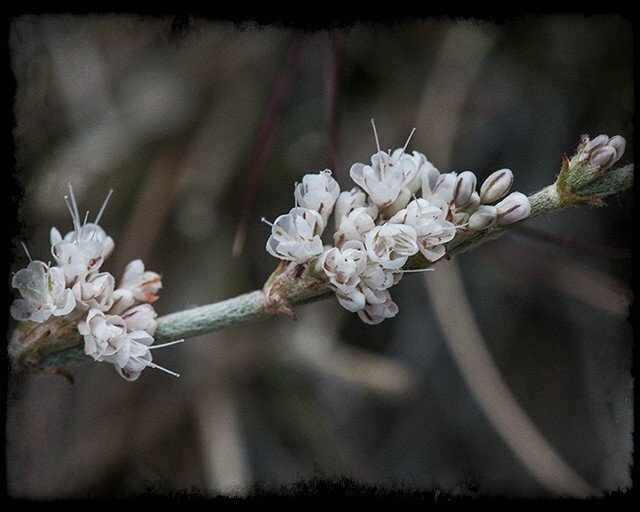 Skeleton Weed (Eriogonum deflexum) and Wright’s Buckwheat (Eriogonum wrightii). Skeleton Weed can be seen all along the roadsides and trails in Sabino Canyon and you probably have seen a lot of these sprouting in residential areas. Look for a basal rosette of tomentose (hairy) roundish leaves in late summer followed by sprouts of branching stems with small, very pale pink or white flowers. Wright’s Buckwheat is blooming in Sabino Canyon at this time of year also but may start as early as June. You can recognize this pretty wildflower by the long branches with clusters of white or pale pink flowers. The clusters of short-stalked flowers are held together by a cup-shaped structure called an involucre (a whorl of bracts subtending a flower or flower cluster). The leaves are small, gray-green and woolly. They are perennial sub-shrubs. I’ve found one at the same location every year where Bear Canyon Trail meets the pavement. Etymology: Eriogonum is from the Greek erion – wool, and gony – knee, alluding to the hairy nodes of the first species described, Eriogonum tomentosum; deflexum refers to the form of the plant and means “bent sharply downward”; wrightii is named for William Greenwood Wright (1831-1912) a California lepidopterist. Skeleton Weed is common and often weedy, and it is an important source of small seed for birds. Metalmark species of butterflies are often found in association with the plants.